If you’re a college student studying public relations, and you need to pick up a few dollars, hang in there. Many companies add staff during the holidays to keep up with increased demand. While it may seem unlikely that a short-term position completely unrelated to PR would open any doors, you never know — you might just end up with your foot in the door of a life-changing opportunity. So this holiday season, don’t turn your nose up at working in the retail or food service industries. Those jobs are not just ideal for earning rent, textbook or beer money, they’re also perfect for earning relevant customer service experience and building communications skills in a professional setting. Here are a few tips to help steer you in the right direction. Pay close attention to opportunities in the most successful industries. Bear in mind, however, that many retail chain stores are doing quite well and will be looking to ramp up beginning as early as October or November. The story’s much the same with discount and luxury retailers who are looking to capitalize on the annual holiday bonanza. Retail isn’t your own only option though; seasonal jobs can lead to public relations career opportunities as well. Although the job is temporary, talk with your boss about your long-term goals and express interest in the company. Take advantage of every opportunity to get involved and learn something new, and make your intentions to secure a permanent position known. If you have an eye on securing employment during and beyond the holidays, focusing on these types of companies with solid long-term prospects is definitely your best bet. It’s common these days to fill out an online application, attach a copy of your resume and hope for the best. But if you’re intent on hooking up with a specific company over the holidays, it won’t do any harm to spend a few minutes in the store letting the manager and others know you’re an interested job candidate. Considering the number of candidates during the holidays, anything you can do to stand out will be to your advantage. If you’re new to the job-hunting process, you may not be familiar with the do’s and don’ts of interviewing. Look professional but be aware that not every employer expects you to show up in a three-piece suit. Make eye contact, be respectful and courteous, and answer the interviewer’s questions as thoroughly as possible. Take the time to peruse some tips and advice online in the days leading up to your interview. Remember, if you’re interviewing for a retail position, don’t talk about how much you want that store discount employees get when asked why you want the job. It’s an inappropriate response and makes you look self-serving and uninterested in the company. Don’t expect to get what you want by waiting until the last minute. You might find something, but it probably won’t be one of the more desirable or higher-paying positions. Most retailers start stocking up and advertising for the Christmas rush right after Halloween, which is a good thing to keep in mind if you’re interested in seasonal employment. The closer we get to Christmas, the fiercer the competition for gigs — particularly ones that pay well — so get started well before Thanksgiving. Once you’ve applied, don’t be shy about following up periodically. 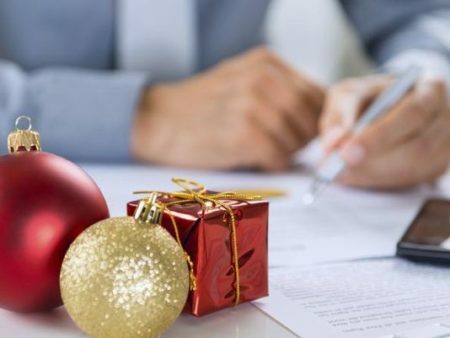 Employers will appreciate your initiative and interest, and it can make the difference between a prosperous holiday season and struggling to make ends meet. Employers are looking for workers who are willing to be flexible and work unpopular shifts now and then. Showing a willingness to work Christmas Eve Day or on New Year’s can earn you the respect of a prospective employer. As with most things, a positive attitude can carry you a long way. Show enthusiasm and a genuine interest in the company and you’re far more likely to make a strong impression. There’s never anything wrong with being a “go-getter” when it comes to job hunting. This is freelance writer Aaron Mean’s first guest post on Culpwrit. My name is Madison Little and I am majoring in Multimedia Journalism here at Southeast Missouri State University. You said during an interview you need to make eye contact, be respectful and courteous, and answer the interviewer’s questions as thoroughly as possible. What are common interview questions for people going into the field of communications?